Here’s something we can all use: cheap auto insurance. I don’t know about you, but I have other things I’d like to be spending my money on! Did you know the Bible says the heavens sing? Now you can hear it. Sorta. In a digital sort of way. Want to get smarter? Check out 14 websites to make you a more intelligent person. Of course, it only works if you actually use them. Because who doesn’t like s’mores? If you have a penchant for new and interesting edibles, you will like this article: 10 exotic fruits you must try. Have I ever mentioned how much I love watching people do something they love to do? Well, I do. And here are two girls dancing, who obviously love it. Get the skinny on insurance advertising right here. Not that I am about to become a gay rights activist, or anything, but this is worth a read. Why do we hate? And is it really any different to hate someone because of their sexuality than it is to hate them because of their skin color or religion? 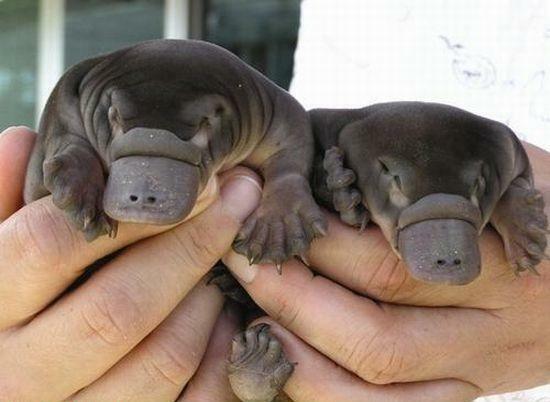 Awwww, baby duck-billed platypi! So cute! Just a reminder than not everything is as it seems. I must make these. They look OhMyGoshYummy. This is interesting. Not sure what to make of it, but it’s interesting. Need to publicize your business or event? Take a look at these promotional products. I’m sure the cookies are tasty, but it’s the pictures of the little girl in this post that are priceless. Am I the only one personally affronted that Inglorious Basterds is misspelled? Seriously? What time it is? as That One likes to say. This will amuse small children for minutes, big kids for hours. Pictorial spice dictionary. Handy stuff for cooks here. Feeling like the proverbial 98 pound weakling lately? Check out these bodybuilding supplements. Apparently, the whole world is going to the dogs, just as we all suspected. But this is one BIIIIIG DOG. Glad I don’t have his kibble bill! Apparently, I am diametrically opposed to the waters off the west coast of Australia. How about you? Oh, this is cool. Young me/now me captures people then and now. Same places, same poses, years apart. Lovely. Hehehehe, this parrot sings! In French! Hahahaha, this guy, Craig, is really in to meeting new people.